'Create…a better neighbourhood', is a FREE event for community and voluntary groups. It's on Wednesday 5 October, full day and half day bookings available. - Finance Tips & How to look after the finances. A light lunch will be provided plus delegate packs for all that attend. 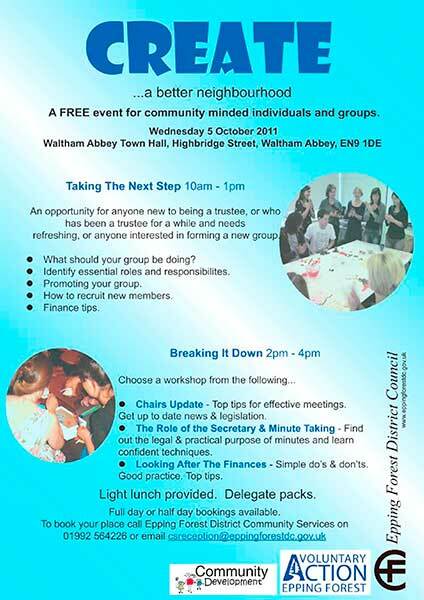 Please take up this opportunity for FREE training to support you and your group. lf you would like to book a place on the training workshop, please call Epping Forest District Community Services on 01992 564 226 or email csreception@eppingforestdc.gov.uk. Please note that places are limited. Members to represent Buckhurst Hill, Chigwell and North Weald have yet to formally appointed. The Old Buckwellians Association will be holding a fun Quiz Night on Saturday 24th September in the Theydon Bois Village Hall. Organiser Graham Frankel is confident this will be better than the average quiz. “We are delighted to have secured the services of Phil Hughes to run the evening’s entertainment for us. Phil is a Radio 2 Producer who has a reputation as an excellent quiz master,” said Mr Frankel. Questions will be a broad mix of music and general knowledge, and there are some great prizes on offer. All profits from the evening will go to St Clare’s Hospice. The June 2011 Parish Council Minutes are now on line, but as the August Parish Council Meeting was cancelled the July minutes will not appear until after approval at the September Parish Council Meeting. 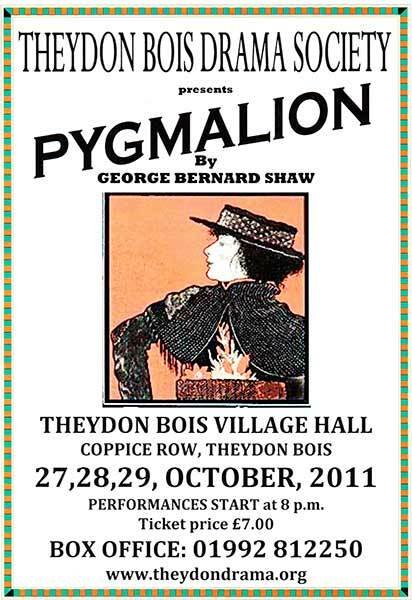 The Theydon Bois Drama Society's next production Pygmalion (1912) is a play by Irish playwright George Bernard Shaw. Professor of phonetics Henry Higgins makes a bet that he can train a bedraggled Cockney flower girl, Eliza Doolittle, to pass for a duchess at an ambassador's garden party by teaching her to assume a veneer of gentility, the most important element of which, he believes, is impeccable speech. The play is a sharp lampoon of the rigid British class system of the day and a comment on women's independence, packaged as a romantic comedy. It later became the basis of the musical 'My Fair Lady' by Lerner & Loewe and then a film musical starring Audrey Hepburn & Rex Harrison directed by George Cukor. As noted in the latest issue of Village News (issue 75 Sept. 2011) we have more photos from both this years Donkey Derby Event and Horticultural Society Show in our Photo Galleries. After discussions between the Parish Clerk, Councillors and members of the Planning Committee it has been decided that there being no urgent business the Council Meeting scheduled to take place on Thursday 25th August week is to be cancelled. The planned F&GP Committee Meeting scheduled for 24th August is also postponed to a later date to be advised. Any outstanding Council business can be dealt with at the September Meeting including of course the outstanding matters in relation to the Community Centre. The ful list of Council meeting dates are here. St. Mary's Church are delighted to welcome Professor Jeremy Dibble of Durham University to a special sung evensong at St. Mary’s on Sunday 18th September 2011 at 6.00 p.m. to celebrate the 150th anniversary of Hymns Ancient and Modern. He will be giving a talk entitled 'Come let us join our cheerful songs' - Hymns Ancient & Modern and how it shaped Anglican worship. Jeremy is the Musical Editor of the forthcoming Canterbury Dictionary of Hymnology and recently contributed to the symposium for the 150th anniversary of HA&M held in Leominster, where the first editor, Sir Henry Baker, had his parish. He was a choirboy at St. Mary’s from 1965 until 1971, attended Buckhurst Hill Grammar and then Trinity College, Cambridge, before going to Southampton University to do his PhD on the music of Sir Hubert Parry. He appeared (chatting to Prince Charles) in the recent documentary on Parry on BBC 4. Victorian and Edwardian British music has always remained a passion for Jeremy, which is probably evident from his books on Parry (1992 rev. 1998), Stanford (2002) and Stainer (2007). He also has a passion for Christmas carols and edited An Edwardian Carol Book, published by OUP. In July after many years of use by the motor trade, the once busy E J Darlington (Garages) Ltd site on the corner of Coppice Row and Orchard Drive was closed and it has now been cleared of motor vehicles and the business signage. Darlington's had been trading in Theydon Bois for over 15 years. 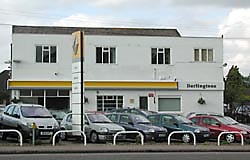 Before then, a motor dealers and garage/filling station had occupied the site for many years and Darlington's was the last of three motor businesses, which had previously served the Village, The firm has, reportedly, now transferred its trading and staff to the main business at Harlow. Mr Darlington has recently filed a planning application with EFDC for the demolition of the Coppice Row (Darlington) Garage and the subsequent construction of a two - storey block on the same site to provide seven – two bed and one - one bed apartments with ground floor patio areas and balconies. Associated work would include closure of the existing vehicular access, formation of a new vehicular access with electronic gates, pedestrian access, and provision for 13 car parking spaces, communal open space and landscaping. 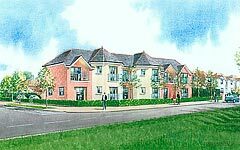 With the excellent views of much of the Village and its Green that this new development will provide it could prove to be popular with potential residents if it gains planning consent. A campsite for 150 tents is due to open in July 2012 on the 'Old Foresters' site adjacent to Blunts Farm beyond Theydon Bois station. It is proposed to run the site from 24th July – 24th August 2012 with a few days either side to set up and clear away. There will be no fixed buildings, fencing or new hard surfaces, but portable structures are to be provided for toilet blocks, showers, security office, registration and Wi-Fi room. Apparently an existing hard surface at the Old Foresters site will be used for car parking of up to 100 cars, although it is claimed the site wishes to attract back-packers and those not requiring private transportation. Access will be via an existing road – Old Station Hill and parking restrictions may be imposed to allow easier access to the site. There may be some short term advantages to our village businesses from an influx of tourists (the camping website links to business pages on this site but no permission was requested), but the proposal has drawn criticism because of the potential disturbance to village residents and harm to the Green Belt. The Planning Department at EFDC has confirmed that as the proposal is for a temporary event and structures for 28 days on this Green Belt land it does not require planning permission. They did though strongly advised that the land owners submit a Certificate of Lawful Development. This as yet has not been forthcoming. It seems the first communications took place with EFDC almost eight months ago, but it is not known if our Parish Council was consulted about the proposals. There is an impressive, but perhaps misleading in a number of respects, website at: www.2012-olympic-camping.co.uk/ run by a company calling themselves "2012 Olympic Camping – The Old Foresters" promoting the campsite and it is already taking bookings prior to obtaining any sort of approval from EFDC. Charges are £15 per person per night with pets at £3.00. At present it is possible, using the booking form, to book beyond 24th August (e.g. 40 days from 24th July). The aerial view on this website highlights two fields in brown that appear not to be either Blunts Farm or the Old Foresters site and are not in the ownership of either Blunts Farm Estates Limited or Parkeng Limited. The hand drawn plans of the proposal submitted to EFDC however do show a location on the Old Foresters land owned by Blunts Farm Estates. The incorrectly highlighted fields shown at present avoid the "moonscape", visible on the wider Google Maps view, of the still to be fully restored, adjacent land of the failed Blunts Farm Golf Course that is the subject of an Enforcement Notice. A "Quiet Countryside Location" is claimed on the website? A claim is also made that the site is only 15 minutes away from the Olympic Park, but that would seem to be an exceedingly optimistic journey time. The Old Foresters site is at present the subject of an appeal to the Planning Inspectorate after the refusal by EFDC to allow a 179 space Car Park on this Green Belt land (see below). Both Theydon Bois and District Rural Preservation Society and Theydon Bois Action Group have raised their concerns about this proposal with EFDC. TBAG have commented about the site owners in a circulated e-mail "They have a history of total disregard of planning law and have been issued with several Enforcement Notices. 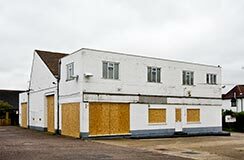 They have been convicted of two planning enforcement contraventions with regard to the location of portable buildings at the Old Foresters site that have been located on the site since May 2008. How can we be certain that the portable ‘luxury showers, toilets, TV room, bars, secure storage lockers and CCTV’ will be removed after 28 days? They haven’t bothered before so why bother now!" A spokesman for TB&DRPS said "We are again, as with the proposed car park, not convinced that this is a genuine commercial venture by the land owners. Rather a process of attrition seems to be continuing with all these proposals that may eventually compromise the Green Belt status of this land that eventually could make it available for more lucrative and harmful developments. If we really value the Green Belt surrounding our village we need to be alert to any encroachments 'temporary' or otherwise". Following on from the violent disorder seen across London and in cities across the UK, I wanted to write to you with some reassurance on the situation in Essex. We have sought to keep our communities informed and yesterday put out a strong message to the public via our website and twitter, as well as through the media. We have seen no violent disorder in Essex akin to what has been happening in larger cities across the country. Where there has been minor disorder, Essex Police has acted quickly to make arrests. On Monday following a burglary in Buckhurst Hill, 13 men were arrested, and following minor damage to a police vehicle in Loughton, two male youths were arrested. In Harlow, four people were arrested for minor damage in the town centre. We have seen a number of young people gathering in large groups in various places across the county, but Essex Police has taken immediate action by deploying public order officers to disperse such groups. This early intervention has meant we have not seen any large scale disorder. Last night (Tuesday) Police officers arrested a 17-year-old man from Clacton for incitement to commit violent disorder after comments were published on facebook encouraging people to gather at a location in Essex and cause disorder. The man remains in police custody. We also arrested two teenagers from Grays and South Ockendon, for using social networking websites for incitement to commit violent disorder. Essex Police is monitoring social media and will not tolerate anyone who uses the internet or any electronic communication device to send inaccurate and false messages intending to incite disorder, or cause alarm. Your support is important to us. Neighbourhood Policing teams remain in place across Essex and Police Officers, PCSOs and Special Constables are working in communities to ensure a high visibility policing presence. Essex Police is doing all it can to ensure Essex remains a safe place to live and work and will continue to work with partners across the criminal justice system to ensure that any criminality is dealt with swiftly and robustly. Theydon Bois Parish Council's Submission. See also below. Just enter 2155393 into the Search Box to find the Appeal and follow the links to make a comment. This can be entered direct or as an attachment. Theydon Bois & District Rural Preservation Society (TB&DRPS) and Theydon Bois Action Group (TBAG) have already submitted well researched and detailed objections to the grounds for appeal by Parkeng Ltd. and the Parish Council are also expected to make an objection before the closing date. Theydon Bois & District Rural Preservation Society(TB&DRPS) Submission. Theydon Bois Action Group (TBAG) Submission. Paul Gardener from Epping Forest Safer Communities department has asked me to bring this local survey to you attention. I am assured that the comments you supply, should you decide to take part, will be anonymous. Epping Forest District Council are conducting a survey to find out what local disabled people and disability groups think the Council should be focusing on to make things better for disabled people. The Council has a role in developing a more equal environment for disabled people and developing awareness and understanding of disability, and this survey will help to make sure the Council is concentrating on what is important for disabled people in the Epping Forest District. Please complete the survey if you have a disability or a connection with disability, and also please pass the survey on to family, friends, and contacts with a disability, or an interest in, or connection with disability. or obtain a paper copy from the Parish Office. As was to be expected Parkeng has appealed the decision by EFDC to refuse the building of a commuter car park in the Green Belt on the site of the Old Foresters Club. The Appeal is to be decided by an Informal Hearing and a site visit by an Inspector. The Appeal Reference is APP/J1535/11/2155393/NWF. The Notification with the grounds for appeal are here. 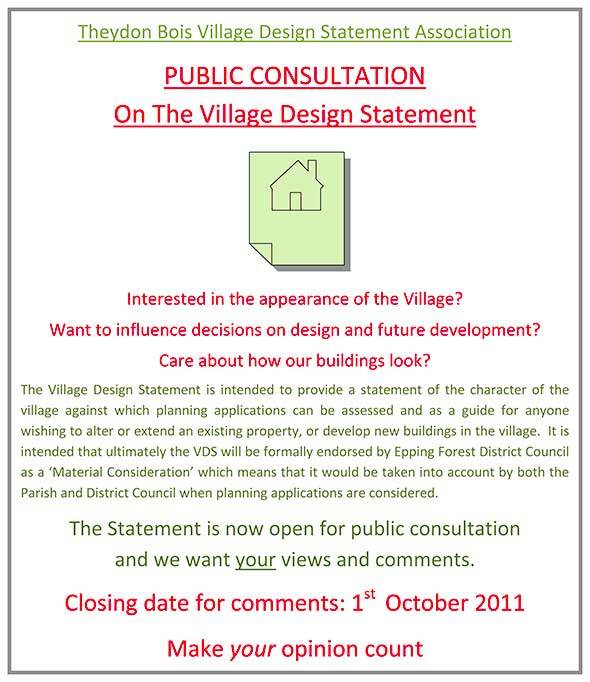 Comments can also be submitted via The Planning Inspectorate website here. Just use the 2155393 part of the reference in the Search Engine to find the form. 101 is being introduced in Essex from Friday, July 1 - it replaces 0300 333 4444. Essex Police is one of the first forces to adopt the new non-emergency phone number - 101. 101 can be used by the public from Friday, July 1, 2011 for all contact with Essex Police which isn't urgent. From Monday, July 4, the Essex Police website will be updated to reflect 101 as the main number to call, replacing 0300 333 4444. The 0300 number will continue to work for the time being but 101 will be promoted as the primary number for the public to call. There is an updated timetable for the Mobile Library Service visits to Theydon from July to December 2011. The Service will visit Theydon Bois on a fortnightly basis on Wednesdays & Thursdays. Wednesday's the Village Hall only from 9.20am - 10.20am. Thursdays the Village Hall from 1.35pm - 3.45pm and Robert Daniels Court from 3.50pm - 4.30pm. The full timetable is available as a printable pdf here. Please try to use this service as in the present climate it is under threat and it would be a great loss especially to our more senior residents. On the B172 Coppice Row from its junction with the A121 at Wake Arms Roundabout in an Easterly direction to a point on Coppice Row, 110 meters Northwest of the common boundary of properties Forest Edge & Ye Old Almshouse. On Theydon Road from a point approximately 863 metres South of its junction with the B1363 in a Southerly direction to its junction with Piercing Hill. Further details and a map are available at the EFDC offices in Epping and anyone who wishes to object to the proposed order should send the grounds for objection in writing to Epping Forest Transport Strategy, E3 Planning and Transportation, Environment and Sustainability & Highways, County Hall, Chelmsford, Essex, CM1 1QH or e-mail: majorschemes@essex.gov.uk by 29th July. 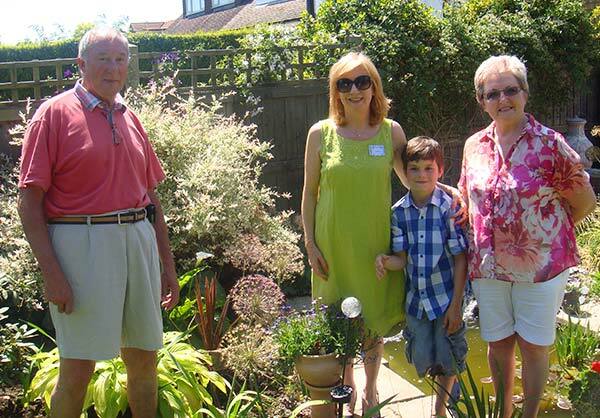 Epping Forest MP Eleanor Laing has praised the efforts of Theydon Bois villagers who opened their gardens to the public. Our annual open gardens day was on Sunday, June 26 2011, when many gardens in Theydon Bois were open for visitors to admire. Mrs Laing, who visited many of the gardens with her son, Matthew, said: "The open gardens day is now a firm fixture in the village's social calendar with people coming from some distance to view the gardens. 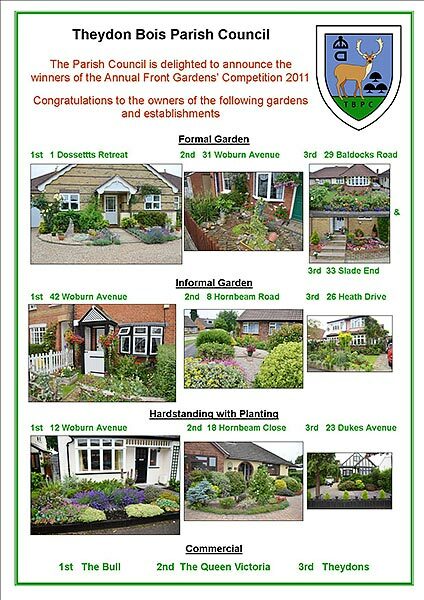 "This was the 31st year that the event has been held and I would like to congratulate the organisers (Theydon Youth with the continued support of the Village Association) and in particular the green-fingered gardeners who make this fabulous event possible."